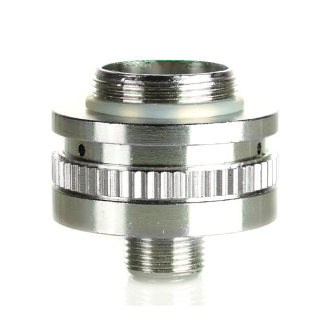 The Kanger Airflow Control Valve allows you to control the airflow of the Kanger Protank 2 and Protank 3. It will also act as a replacement control valve base for the Kanger Aerotank. NOTE: PG high E-Liquids vape better when the airflow is cut off or lessened; VG high E-Liquids vape better with more airflow. Remove your current base, install a coil in the Airflow Control Valve and screw onto the tank. NOTE: Use the coil that corresponds with the Clearomizer you are using. Adjust the controller ring left or right to cover or uncover the holes on the controller. NOTE: Moving the ring to the left will reduce airflow, giving you a tighter hit. Moving the ring to the right will increase airflow, giving you a looser hit.